Power Flame has a long-established reputation in the burner and boiler accessory industry of producing, among other things, high-quality burner instrumentation and control systems. We at ATI, in the interests of bringing only the best products the market has to offer to our customers, can facilitate the selection/purchase of any of Power Flame's instrumentation and control devices. Power Flame can custom-engineer a burner instrumentation and management system for your specific application and ensure it will fully integrate into your other burner/boiler system components. 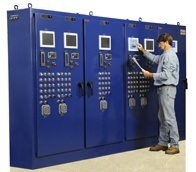 They can create for you a complete burner management system in a timely manner and at a competitive price. Power Flame will also factory fire-test the finished product to ensure 100% satisfaction. Power Flame uses high-tech, computer assisted design allow for full flexibility in component selection and system building. From a basic outline of required operating standards, Power Flame can computer-generate a management system design that will answer the needs of your application. Power Flame's burner management devices include the Model DC-4-AS Sequence Over-fire Draft Control Monitor. This device can control both positive/negative combustion-chamber environments so as to keep combustion continually optimized for efficiency. Power Flame makes numerous packaged burner management systems, and lead/lag controls are a key component in many of them. A lead/lag control system can be customized to a variety of burner control systems, ranging from the simple to the highly complex. Power Flame can provide a lead/lag system for a multi-pressure or multi-temperature configuration or for a single-pressure/temperature system.